Kris Moore from the PC-BSD development team announced today the immediate availability of the second maintenance release of PC-BSD 7.0 (Fibonacci Edition). "The PC-BSD Team is pleased to announce the availability of PC-BSD 7.0.2, with an updated FreeBSD 7.1-PreRelease under the hood and the latest KDE 4.1.3." - said Kris in the official release announcement. Therefore, PC-BSD users can upgrade their systems today with the new version, which includes KDE 4.1.3, improved support for NTFS partitions, better desktop performance for owners of Nvidia video cards, enhancements and fixes to HAL, bug fixes to the installation. · Resolved three System Manager bugs. How to upgrade? Just apply the update and reboot your PC-BSD system. Remember that it may take 15-25 minutes to complete (depending on your system's specs). If you want to install PC-BSD, it is recommended to have at least a Pentium 4 or higher CPU (or AMD64 alternatives) with 512 MB of RAM, minimum 12 GB of free hard drive space (either a partition, or an entire disk), a network card, a sound card and a 3D-accelerated video card (Nvidia or Intel). 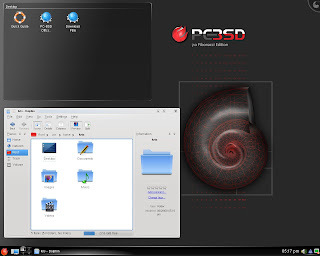 PC-BSD is a free operating system, based on FreeBSD, created with ease of use in mind. Like any modern system, it allows you to watch movies, listen to your favorite music, work with office documents, and install your favorite applications with a couple of mouse clicks (and a nice setup wizard). PC-BSD 7.0.2 can be downloaded right now from Here (Link 1), Here (Link 2).